The Ubiq team (specifically @xocel) had set up real-time alerts to monitor the Cryptopia Ubiq and Ubiq Token funds addresses. We recently saw some funds moving. The good new is that Cryptopia staff confirms they are making these transfers so all Ubiq and Ubiq Tokens should be unaffected by the Cryptopia security breach. Some chat below with a Cryptopia staff member. That's very good news! I still had some lying around there. I hope that they will be returend to rightful owners and not be distributed to everyone affected. The Ubiq developers are proud to present to you after months of development and testing Go-Ubiq 2.1. This is the biggest code update to the Gubiq full node that we have ever released. Gubiq 2.1 is based on the last release of the upstream Geth 1.6.x branch and includes block downloader/synchronization code refactoring, consensus code refactoring and a slew of other optimizations. This release contains around 500 commits merged from upstream Go-Etheruem. This is an optional release but highly recommended. The Gubiq 2.1 release does not contain any hard forks but sets the stage for a future update to the upstream Geth 1.7.x branch. We will then schedule a hard fork which will include the Byzantium hard fork changes. As a recap, the last release of Gubiq contained the UIP 1 hard fork which switched out Ethash to our own independent hashing algorithm Ubqhash. Since this hard fork we have observed what we predicted and we were successful in combatting Ethash rental attacks against various chains. These chain reorganization attacks ranged from small chains to the 2nd largest Ethash chain Ethereum Classic. We're going to continue testing more scenarios and different OS's to see what needs to be fixed before we put out a Final release. As mentioned, we do not anticipate any issues with Ubiq and Ubiq Token funds. Congrats! Great to read that Ethashrental attacks are able to be stopped. Lots of development going on! We have just release Gubiq 2.1 but we are already working on the next release as well as the update to Fusion which will have the new Gubiq 2.1 node. I've recently discussed the version scheme and roadmap for the Gubiq core node for the year ahead with @xocel. This will involve 4 more releases and 2 hard forks. Look out for a blog post announcing this as well. These releases will track the final versions of the upstream Geth branches and will involve a 2-step 2-release process. The first release will be matching the final release of that branch and associated updates. We will then perform some hard fork tests. Once that is concluded we will release a new version with a new major number release signaling a hard fork block. Here is the Gubiq version scheme and roadmap ahead. Note that Gubiq 2.1 is the current release. PiNode short update about gubiq 2.1 and some other related pi node stuff. The latest Trezor v1.8 firmware requires us to upgrade Pyrus to use a new version of Trezor Connect v7 backend API. Currently sending Transactions doesn't work with v1.8 firmware and Pyrus. Previous firmware v1.7.3 of Trezor works fine with Pyrus. The quick workaround is to use mycrypto.com or myetherwallet.com and select the Ubiq network and Ubiq HD path. Both sites are tested and work fine. We'll test and get a fixed version of Pyrus out ASAP! Thanks to new Ubiq Discord user @ambidextrous1 for reporting the issue! As mentioned, we did not anticipate any issues with Ubiq and Ubiq Token funds on Cryptopia. Their recent announcement confirms NO issues with the Ubiq Tokens. We do NOT anticipate any issues with Ubiq (UBQ) held on Cryptopia as we continue to monitor the address and the funds have NOT moved. 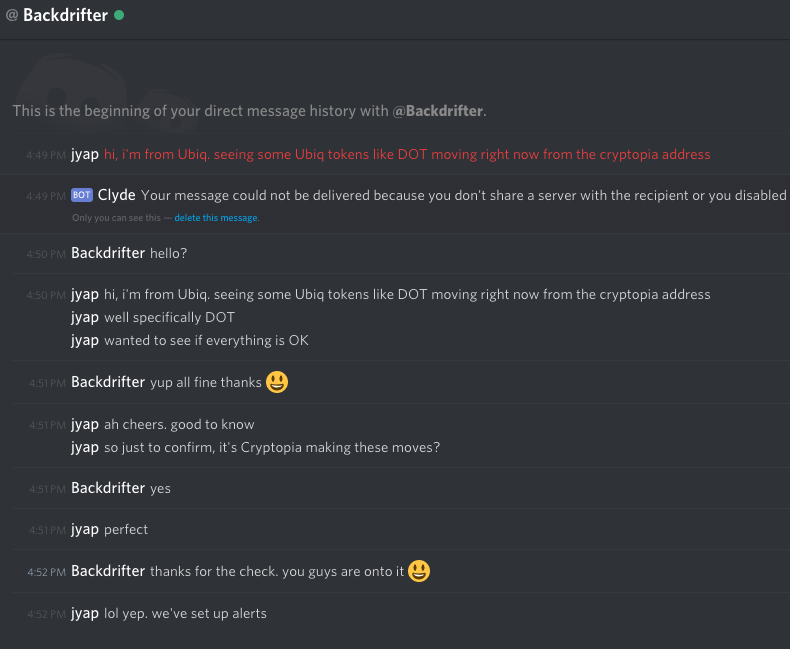 The explanation (and also mentioned to us) is that the Cryptopia team has not yet gotten around to moving those UBQ funds to a new address. We are very excited to announce that GeoCoin will be participating in the CoinFest Vancouver 2019 conference. Events are scheduled for April 1 - 7th, be sure to check out the facebook event for more details. We hope to see you all there! Additionally, we have revised the version scheme and roadmap to get us on the Geth 1.8 branch sooner (scroll up for the old plan). We are currently working on Gubiq 2.3. Something we have started discussing in #ubiq-research is the possibility of having ESCH maintaining the governance aspects but also becoming a staking token as a Cosmos hub. There's more to research as a group with this and there are some links in that channel. It's a new and interesting technology so hopefully we can explore this out as a community. None of the coins on that site were moved so you should recover them shortly from my understanding. Never leave coins on an exchange unless activly exchanging them. The latest update to @GuardaWallet for iOS now has Ubiq support! It's good that the UBIQ developers not forgotten the project and continue to work. I believe in the coin and keep some UBIQ in my wallet! Everything you wanted to know about @cosmos in one post. We cleared up some questions regarding token transfers vs. atomic swaps, competition with @ethereum + @polkadotnetwork, @binance chain, @zcashco and Atoms.